BASEL CITY, Switzerland - May 2, 2018 - PRLog -- Yerra Solutions AG, a leading global provider of innovative solutions for legal & IP, eDiscovery & investigations and compliance, has announced that its GDPR Software Market Report, powered by Yerra's Lex Connect platform is now available. 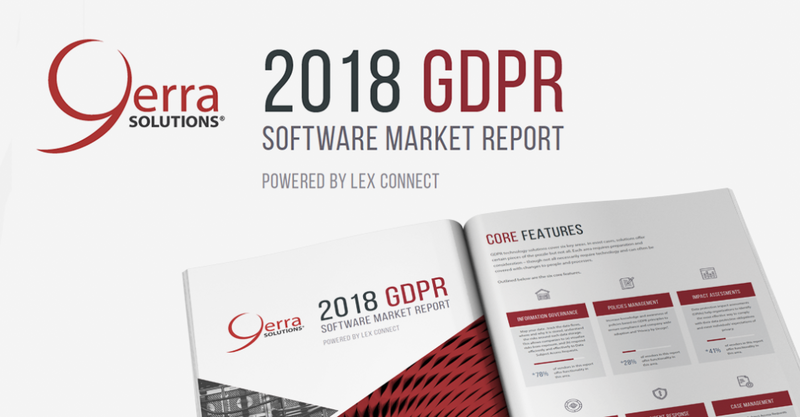 The report covers 32 GDPR software vendors and includes analysis and guidance from Yerra's technology and compliance experts. It is Yerra's position that no technology will ensure compliance alone – but may help guide companies in the direction of compliance, reduce labor costs and minimize company risks. On its own, the GDPR Software Market Report provides sufficient guidance to begin an evaluation of whether an organization needs a GDPR software solution and what might be the right solution for certain requirements. Additional consultative insights are available from Yerra's GDPR experts to supplement and personalize the findings in the report. The report may be purchased here. Members of the media can request a free copy by emailing kristen.wylie@yerrasolutions.com. Yerra serves the operational and technology needs of legal & IP, eDiscovery, investigations and compliance organizations. The company's offerings include consulting and technology-enabled managed services that drive operational efficiency and improved outcomes. Yerra is headquartered in Basel, Switzerland with offices in the UK, US, Singapore, Hong Kong and Poland. Learn more at www.yerrasolutions.com.